One-third of the world's food is spoiled or tossed rather than eaten, a fact that is tragic when nearly one billion people go hungry. The injustice of food waste is worsened by the fact that food decomposing in landfills emits greenhouse gases that contribute to climate change. The conventional management of municipal waste in landfills places discarded food and plant matter into an anaerobic environment, initiating a chemical reaction that turns biomass into biogas – specifically methane, a greenhouse gas that's 28 times more potent than carbon dioxide. 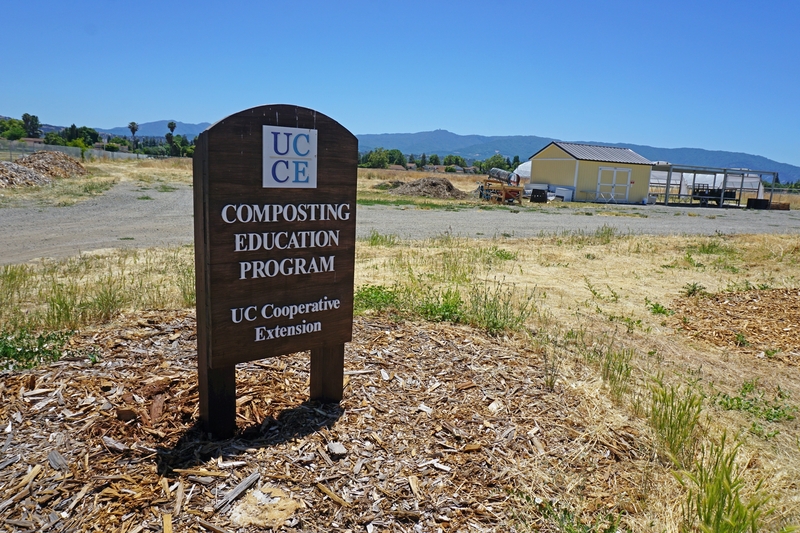 The UC Cooperative Extension Compost Education Program facility at Martial Cottle Park in San Jose. Reducing the volume of the California waste stream and reducing the emission of greenhouse gases into the atmosphere are objectives that have spurred state lawmakers to enact regulations, such as Assembly Bill 939, which in 1985 mandated a 50 percent diversion of solid waste away from landfills. A 1989 update to the law also required municipalities to reach out to residents with training on greenwaste etiquette and waste diversion. 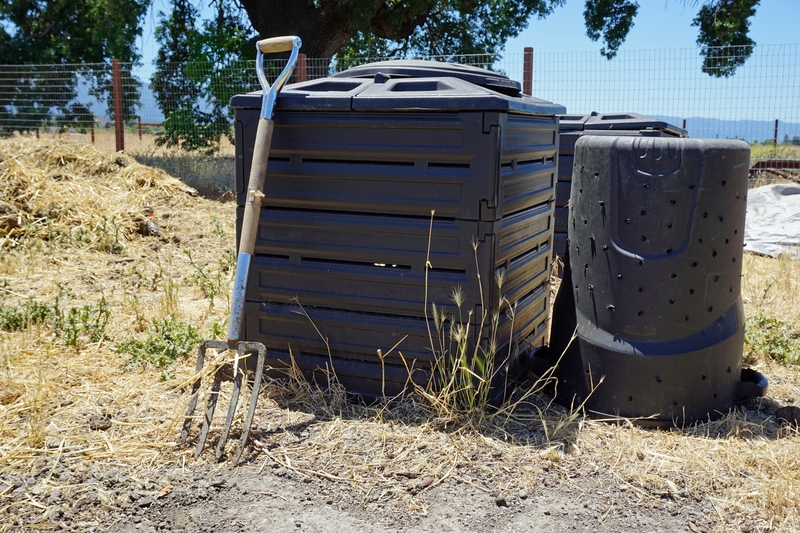 UC Cooperative Extension is working closely with the cities and county of Santa Clara in a far-reaching program to divert organic matter – food and green waste – from landfills by composting and using the product to enrich soil in the home garden. 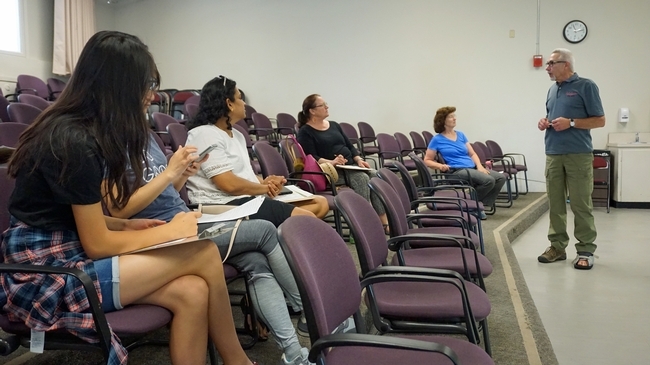 UC Master Composter Don Krafft, right, presents information on composting during the class in Palo Alto. In early June, UC Master Composter Don Krafft conducted a class on composting in a Palo Alto community center, one of 22 sessions to be offered in the spring and summer of 2018. A retired telecommunications professional, Krafft's interest in composting stemmed from his work as a Master Gardener for UC Cooperative Extension. 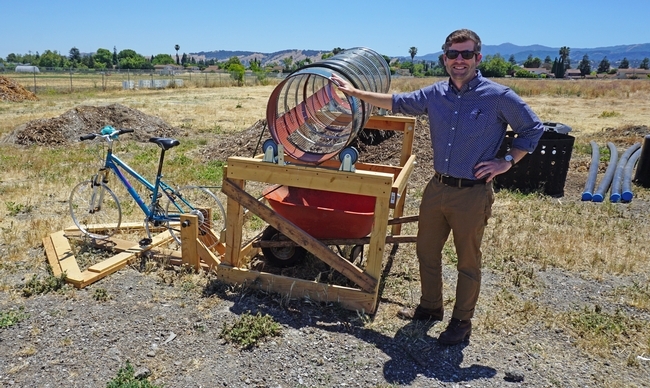 The composting workshops are just one component of the UC Cooperative Extension's composting efforts in Santa Clara County, led by UCCE staff research associate Cole Smith. The Environmental Protection Agency has a food recovery hierarchy, he said, which has source reduction at the top, followed by feeding the hungry, feeding animals, industrial uses, then composting, and finally delivery to a landfill. Coordinator of the UCCE composting program in Santa Clara County, Cole Smith, stands with a bicycle-powered compost turning tool at the demonstration site. The classic composting technique involves layering “browns” – dry leaves, sawdust, woody cuttings, straw, shredded newspaper and cardboard – with “greens” – grass clippings, food scraps, coffee grounds, egg shells, green plant cuttings and manure. Certain foods should not be added to the home compost heap – including meat, whole eggs and dairy products. The mix of greens and browns should be maintained evenly moist, but not soaked, and turned at regular intervals, the more often, the faster the materials decompose. “Maintenance is completely adaptable. You can do a lot or a little and it gets easier with time,” Krafft assured the audience. The compost is ready when the components are no longer recognizable and the pile is cold. Once composted, the former waste becomes a stable soil amendment with a pleasant earthy smell. It's then ready to be applied in the garden. Compost bins at the UC Compost Education Program demonstration site. 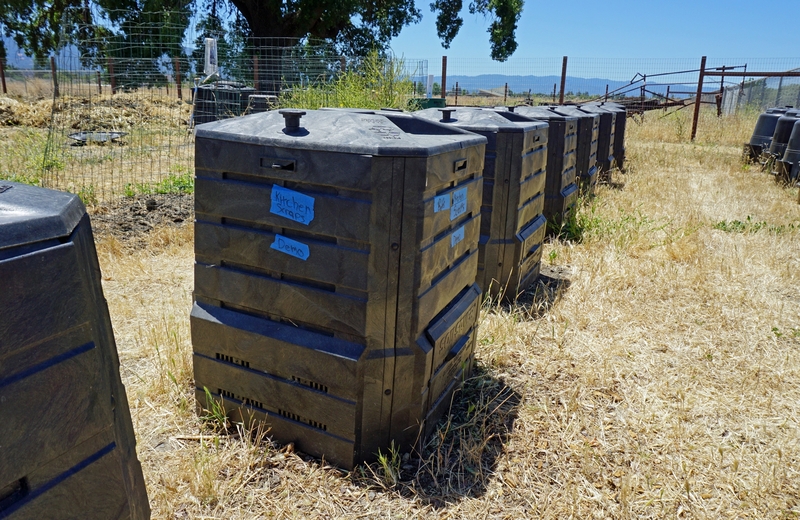 UCCE Santa Clara has also developed a three-acre composting demonstration site at Martial Cottle Park in San Jose, where volunteers are composting animal waste generated by the 4-H animal program in a project made possible by a grant from the Santa Clara Valley Water District. The facility includes a variety of commercial and homemade compost containers, including one built by a volunteer that employs bicycle power to mix compost. The issue of food waste is capturing significant attention not only in Santa Clara County and not only in the garden. Food waste reaches across multiple disciplines, including agriculture, environment, and public health, key areas of UC Agriculture and Natural Resources' efforts. 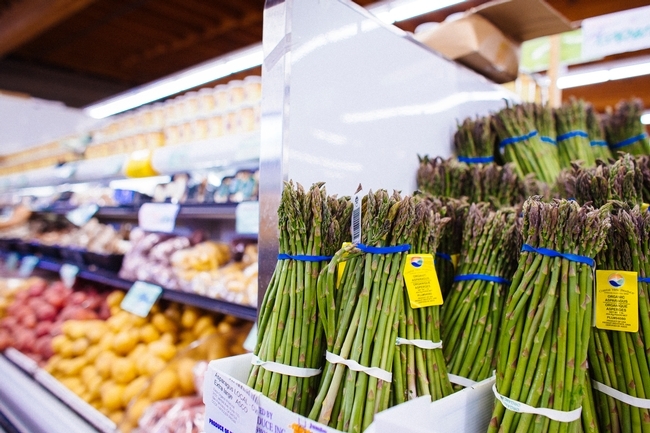 “Food waste is a symptom of our food systems and food practices going astray,” said Wendi Gosliner, a project scientist in the UC ANR Nutrition Policy Institute, co-founder of California Food Waste Prevention Week, which was held for the first time in March 2018. “Addressing the issue requires researchers, practitioners, policy makers, communities and individuals to innovate and develop new solutions,” Gosliner said. “UC ANR translates research to practice in helping communities manage food resources, learn to preserve food and compost – all parts of the food waste solution,” Gosliner said. 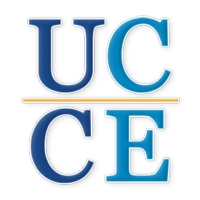 “Thinking about these and other UC ANR activities under the umbrella of food waste prevention can help to better nourish people, protect the environment and conserve human, natural and financial resources. A commercial home compost bin, left, and a bin improvised by cutting holes and the bottom out of an ordinary plastic trash can.